Snappers are a family of perciform fish, Lutjanidae, mainly marine, but with some members inhabiting estuaries, feeding in freshwater. Some are important food fish. One of the best known is the red snapper. Snappers inhabit tropical and subtropical regions of all oceans. They can grow to about 1 m (3.3 ft) in length. Most feed on crustaceans or other fish, though a few are plankton-feeders. They can be kept in aquaria, but mostly grow too fast to be popular aquarium fish. They live at depths reaching 450 m (1,480 ft). About 100 species are currently recognized, divided into about 16 genera. 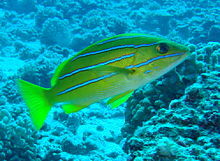 A large number of species have "snapper" in their common names; most but not all are Lutjanidae. Nearly all of the 60 or so species in genus Lutjanus have common names that include the word "snapper".